* Dog to dog aggression? * Is too hyperactive around other dogs? * Has no social skills? 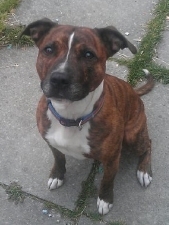 * Has come from a rescue shelter and needs to be socialised? Socialising and rehabilitating sessions work on the same lines as dog walking but involves a lot more training and is a slower introduction for those problem dogs. I come and collect your dog to start integrating them into social situations. First starting off in a quiet safe area with just one good behaved calm dog at a distance gradually getting closer and then slowly introducing them while walking this is all done in a controlled and calm situation if the problem dog starts to get stressed or anxious we will go back to the beginning and start again at a even slower pace until your dog is completely comfortable with the situation we are creating for them. Slowly step by step with time we will up the pace and enter every day situations eg parks, beaches, town centers and all the places you wish you could take your dog(s). We want you to be able to enjoy walking them just as much as they enjoy being walked! There is no 'quick fix' for these dogs but in given time you will start to see the progress your dog will achieve. We keep you fully up to date of the progression your dog is making. And for those owners that need a little one 2 one help from us to know how to continue the good work your dog is doing in making new friends we will do a few sessions together so I can help you out on your techniques, how to react around other dogs and how to improve your dogs social skills and confidence around other dogs. Bailey was attacked at a younger age since then his social skills went down hill, he would lunge at dogs across the road, growl, pull towards them and get very frustrated on walks. Because of this it got harder and harder for his owner to take him places for walks having to check and constantly worry there are no dogs around and it was very hard to let him off the lead because of this problem..... This was no fun for the owner never mind bailey! Then Talley Wags come along! 4 Months Later ...... Bailey On His First Ever Group Walk! Bailey now walks with most other dogs on lead, he can walk down the street happily even when other dogs walk past on the same path, he has been to doggy parks, beaches, dunes and even in a dog friendly pub sitting calmly realxing with his owners family and their dogs. 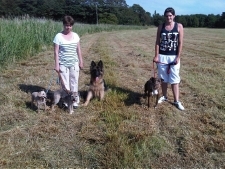 Bailey can now be off the lead with other dogs that he knows and is completely relaxed in just doing his own thing! Bailey has come so far and done so well in his rehabilitation, he gets to go on better longer walks daily and his owner can relax and have a lovely pleasant walk too! Bailey still comes across situations that need to be worked on but i have faith in him, his owner and the work i do. He still needs his muzzel on as a safety precaution but with more work from myself, the owner and of course Bailey am sure this will not be far from the next step! 12 months later I can happily announce that bailey has a new member to his family! Bailey now has a little sister boxer puppy ‘Lexi’ living with him. Bailey’s progress in his sessions and the work that Lois has put in has just continued getting better and better and he is now a happy, relaxed, social dog and is loving the company of his little sister. A very much deserved well to done Lois & Bailey and all the best for the future. If you think you or your dog would benefit from Talley Wags Socializing and Rehabilitating sessions please don’t hesitate to give me a call to get you and your dog started on a better enjoyable life.